Who really enjoys reading nutrition fact labels? I mean, really? But here’s why I think those nutrition fact labels are a huge part of any real food journey. But I’m getting ahead of myself. Let’s back up a bit. I often get asked, “how to get my family/spouse/friend/etc. on board with real food?” And it is a really valid question because sometimes the biggest hurdle to making real and lasting change is having the support of those around you. My husband has always been supportive of me, but didn’t necessarily “get it” at the beginning. Luckily for me, he eats anything. And he soon realized how much better real food tastes. But I think what really got my husband on board was letting him see for himself just how corrupt, fake, and processed most of the “food” on today’s grocery market shelves really are. By shoving those tiny but telling nutrition fact labels in his face he was able to see why real food is so important to me. And now, he’s a bigger advocate for the real stuff than I am! So how do you teach people the truth of processed food? It’s all fine and good to talk about the dangers of vegetable oils, the goodness of saturated fats, the dangers of artificial food dyes and sweeteners, etc. But until you show people just how pervasive all that junk is there’s not going to be a whole lot of motivation for change. It’s a simple game. Go to your local grocery store. Pick up a food “item” and turn the product over and read the nutrition fact label. But here’s the thing: I’m less worried about the percentage of fat to calories, or number of carbs or protein. Real food comes in all varieties and you NEED those basic building blocks of fat, carbs, and proteins. No, what I’m interested in is the ingredient list. When it comes to those too-often-ignored nutrition fact labels, the most telling thing is the ingredient list. It’s even more fun if you search out the “healthy” labels and marketing tactics aimed to make people think something is good for them. Turn that package around and be amazed. That’s when perspectives shift, and the real transformation begins. Here are a handful of products to give you some insight into the game. My husband played this round for me… he loves decoding food labels. It took him all of 3 minutes to choose these items. Label says: “Heart Healthy.” Yeah, right. I’m sure you’ve seen those “heart healthy” labels on certain packages. I remember, during my early college days, feeling proud to buy cereals, crackers, and the like with the little symbol on it. Obviously I was doing something good for my body, right? Cornstarch? Yeah, mostly likely GMO. Monosodium Glutamate (MSG)…. NOT good. Read more about that here. Gelatin can be very beneficial (assuming you’re okay with animal products in your peanuts), when it comes from grass-fed animals, but how much you want to guess this is coming from CAFO meat pumped full of hormones and antibiotics? Yeah, skip it. Corn syrup solids. GMO. Gross. ‘Nuff said. “Natural flavors” Did you that MSG, Aspartame and bugs in your food are all considered “natural flavors” and “natural colors” (source)? Yep. Don’t trust the “natural” labels. Somehow all this not-real-stuff is supposed to be good for our hearts? I don’t think so. In a press release the AHA’s president, Gordon Tomaselli, said the program would make “it easy for consumers to make smart choices that are heart-healthy when eating outside the home, knowing they often don’t have the benefit of reviewing the nutrition facts.” The meal certification program is an expansion of the AHA’s Heart-Check Food Certification program, which was established in 1995. 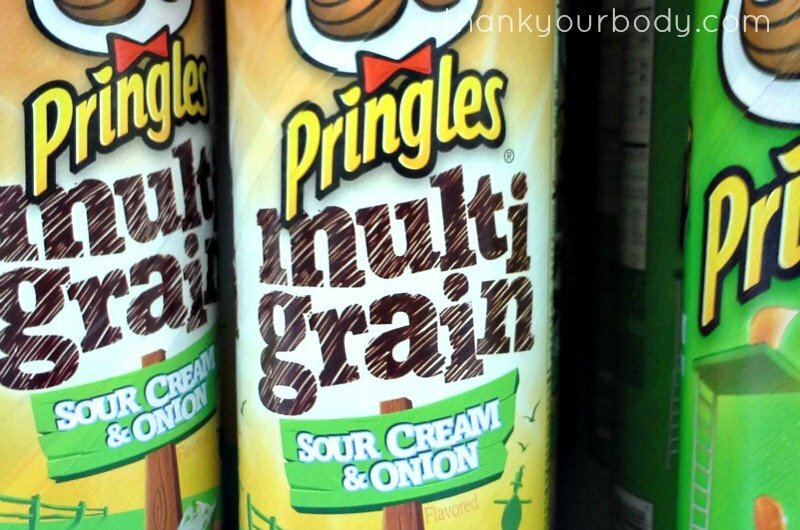 Remember a few years ago when “whole grain” and “multi-grain” were all the rage in terms of healthy marketing? I remember buying a package of multi-grain Wheat Thins (my favorite processed food of all time) and thinking I was doing good. But don’t let the hype get you. Vegetable oil. YIKES! This stuff is everywhere and, in my opinion, one of the greatest downfalls of healthy food options. Learn why I avoid vegetable oil at all costs here. Hey look! Our friend MSG is back…. and “natural flavors.” Ugh. Cultured nonfat milk sound innocent enough… but remember why nonfat milk is really bad? No? Read this. Then we have all the chemically sounding ingredients. Just skip those, friends. “Trim! ?” I don’t think so. This was actually the first item my husband picked up. “What does 2% Trim even mean,” he wondered. Good question. Looking at the outside this reads as an innocent and simple food. I mean, cottage cheese… low fat…. trim…. Sounds healthy enough. Especially when you consider how easy it is to make cottage cheese, and how few ingredients it really takes. Nonfat milk is not a surprising ingredient, but as a rule of thumb: If something naturally has fat, removing it is usually done through a very unnatural (and unhealthy) process. Even if this was the only ingredient, I’d skip this product completely. Guar Gum is found in a lot of products, like organic ice cream… and in moderation it’s probably not the worst thing in the world, but still not something you want to eat all the time. Learn more here. Citric Acid… sadly, most likely GMO. Acetylated Monoglycerdies, Pamitate, and our good ole’ friend “natural flavor”…. no thanks. Polysorbate 80 is an amber/golden-colored viscous liquid used as as an emulsifier or surfactant in foods, medicines, skincare products, vaccines… and, of course, mouthwash. It helps bind ingredients like oil and water to each other. There are studies showing that it has been linked to infertility in mice, accelerated the maturation of female rats and resulted in severe ovary deformities, and an increased risk of blood clots, stroke, heart attack, heart failure, and of tumor growth or recurrence in patients with certain types of cancer. Don’t get overwhelmed, get smart. Here are some more products worth “flipping over” to see what’s really behind the labels. So I don’t think anyone would pick up this Jell-O pack and think “health food.” But it illustrates one of the most widely used labeling tactics with that tricky little “made with real milk” on the upper right hand corner. Somehow that’s supposed to give us confidence that this is actual “real” food. Right? Nah. You can’t be fooled that easily. Sodium Stearoyl Lactylate, Sodium Alginate, Carob Bean Gum… unnecessary additives. Natural and artificial flavors. Since we know that “natural flavor” can include bad things like MSG, just imagine what “artificial flavor” does to your body. Titanium Dioxide, Caramel Color, Yellow 6, Yellow 5… real food shouldn’t need coloring agents, especially artificial ones that cause lots of health problems. Of course that’s just the pudding ingredients! Once you consider what goes on top (vegetable oils, BHT, and more artificial junk!) you’ll really want to skip this dessert and make your own (more delicious) healthy real food treats. Like this yummy Creme Brulee. Marketers are very smart when it comes to promoting food. Whether it’s high protein, low fat, low calories or whatever other “health trend” is in, you better believe they will capitalize on any perceived virtues of their food. Take for example these Special K popcorn chips. Special K has been well known to promote diet foods, particularly to women who want to lose weight. 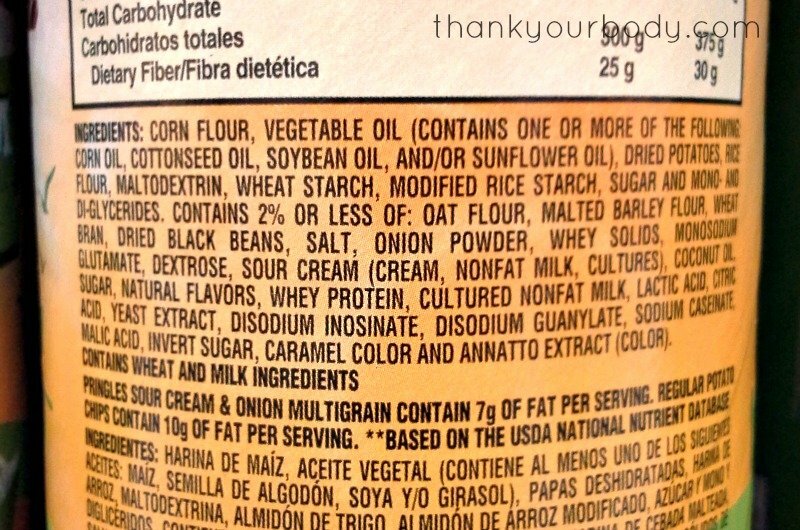 The first two ingredients are no surprise as a high percentage of processed foods contain both corn and rancid vegetable oils… both of which are cheap and most likely GMO. Add in some artificial flavors (which again, who knows what that means! ), nonfat milk (again, not real food), and other unpronounceable stuff, this is anything but healthy. Remember: Empty calories DO NOT NOURISH. Pop Tarts. Raise your hand if you had these in your home growing up? I sure did. And I loved them. Heck, I remember occasionally buying these from the vending machine during grad school when I was famished. I didn’t think they were health food by any means, but surely something that’s “made with real fruit” couldn’t be that bad, right? What’s even more disturbing about Pop-Tarts (and the like) is how targeted they are toward children. Just popping over to grab a quick snapshot of this box ended up with my little two year old all excited. Why? Because Pop Tarts has a hop-scotch game branded on the tile floor in front of their product. Start ’em young, I guess. Let’s check out the nutrition fact label and see why this is something nobody should eat, especially young and developing little bodies! “Enriched” flour (which is just another term for processed flour that has been stripped of all nutrients so that synthetic and often GMO vitamins are added back in. Not really “enriched,” if you ask me. Following that we have corn syrup and high fructose corn syrup. Sweeteners with no nutrition, GMO to boot, and hiding in so many (especially kid) products. We have soybean oil (remember why I HATE vegetable oils) which is also most likely GMO. Plus I dislike soy for many other reasons. We have all sorts of ingredients with long names that do nothing but add shelf life, color, and other things that real food doesn’t need. Why have some artificial food coloring… another “kid-friendly” ingredient that should not be fed to children. But, hey! Look! Vitamins! Again, most vitamins added back into processed foods are synthetic (and not easily accessible by the body, at best) and often GMO. So yeah, skip the Pop-Tarts. Make some soaked oatmeal, a couple of fried eggs in coconut oil, sprouted toast with raw butter on it, a homemade smoothie…. anything but these. At first it can be terrifying to walk through a store reading all those nutrition fact labels. When you see how much fake junk is lurking in everything it can be overwhelming. It can be even more overwhelming if you are pulling these products out of your pantry and realizing the assault of not-so-good-for-you-man-made crap that is sneaking by as “food.” But don’t get overwhelmed, just get smart. Start by adding more real, wholesome, simple foods into your diet and let the processed garbage slowly go by the wayside. The best way to beat nutrition fact labels syndrome? Buy food that DON’T have nutrition fact labels. Real food is full of goodness. If you stock up on a variety of your favorite non-labeled stuff you’ll be doing good. Promise. Of course, if you ARE feeling overwhelmed, check out my ebook Processed Free. It’s the stress-free guide to real food. Really… stress free. If you give it time it gets easy… even fun. And real food tastes a WHOLE lot better. So, that’s always a win in my book.